The Holly is a charming two-story home that boasts a finished floor area of 3,224 square feet and a total area of 4,817 square feet. Its garage can accommodate as many as 3 cars, and it also has a covered porch and a deck. 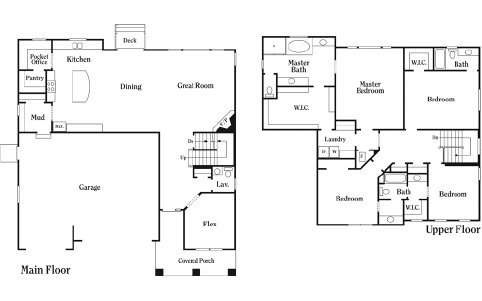 The plan features 4 rooms, all of which are found on the second floor. The master bedroom has a spacious bath and walk-in closet, but all bedrooms in the home have their own or a shared bath and closet space. The first floor of the home has a great room with a fireplace, dining area, and island kitchen. This floor also has a pocket office, a pantry, and lavatory. Building a home is usually a stressful process, but not if you’re working with Perry Homes. A trusted builder of heritage houses and friendly communities, our company offers a seamless design and construction process. We have design specialists that work directly with our clients, as well as a selection of financing options. What’s more, we offer premium construction quality at reasonable prices, and we also address post-construction concerns for clients who have already moved into their new house. Start building your dream home in Utah today. To find out more about any of our house designs and financing options, simply drop us a message on our Contact Us page or call 801-264-8800.